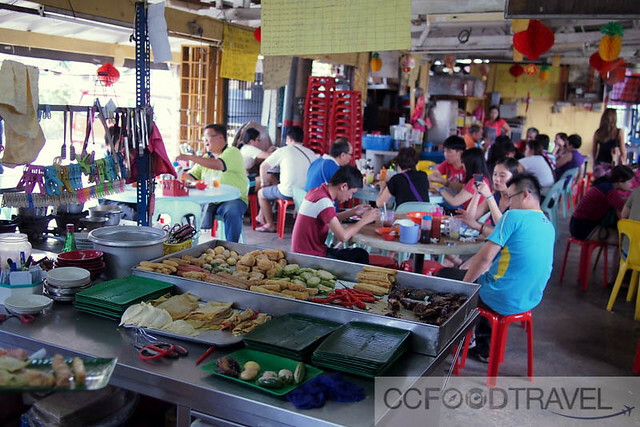 So, we went towards Jinjang one fine weekend, in search if this Chili Yong Tau Foo dive, we’d heard about. Not just any old chili. We are talking a chili strength that’s one heck of a lot closer to pepper spray pain level. Where the truly wild, world of extreme chilies reign supreme. Hiccups, sweating, and a burning sensation that seems to envelop your entire torso.. you reach for ice water or ice leong-char, but there seems to be little reprieve from the fiery sting of the heat. Well thank God there’s also the other, more mundane offerings at this Yong Tau Foo joint. 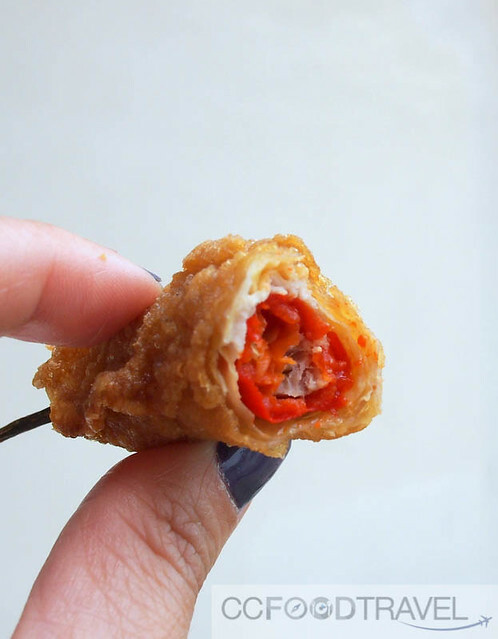 We sniff around the kitchen, such as any good blogger would , and we notice repetitions, crowd favourites if you like, such as the stuffed augerbine, ladies fingers, long beans, tofu pok, deep fried foo chok and sui kao. The Jalapeno, green, shiny and plump with promise of wanton sweetness, catches Cumi’s eye, and he mutters.. we must have that. Good lord.. believe me when I tell you that they stuff everything you can think of that’s stuff-able. Sausages. 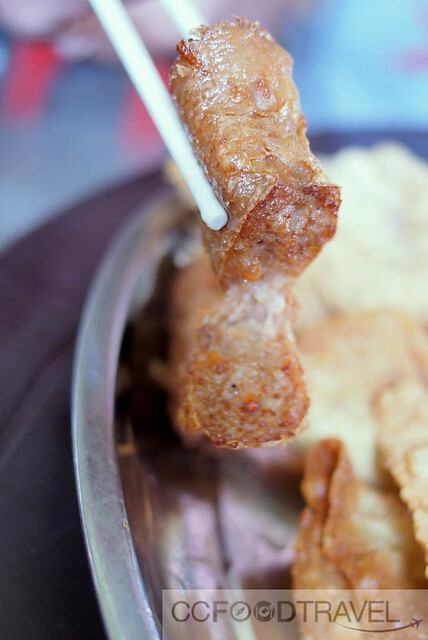 Yau Char Kway. Even long beans. I bet they’d stuff a sock without batting an eye, if it landed on their table. The way they stuff items is precise. Mechanical. Swifter than a speeding bullet train. 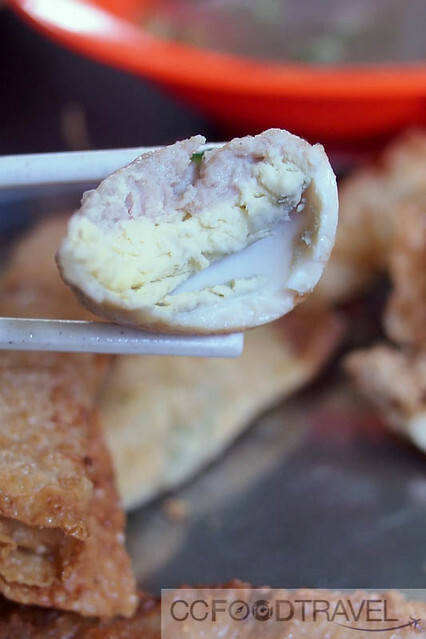 A mixture of fish and pork paste, stuffed Yau Char Kwai. 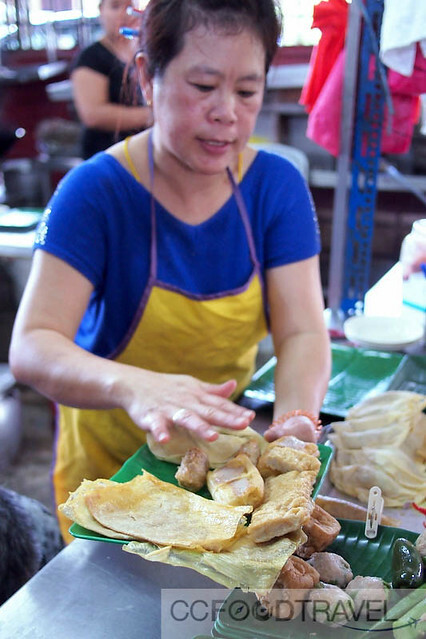 The artery destroying Yau Char kwai, stuffed with pork and fish stuffings.. then deep fried. hmmm, it’s like a conspiracy to clog your heart in the fastest manner possible. Of course we blatantly ignored the health warning label and ordered it. 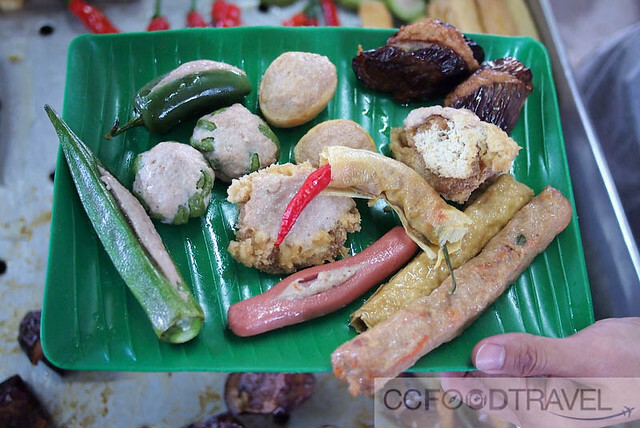 From the way folks were picking these from the tray, we suspected that the reverse taufo pok and the lobak might be pretty decent as well. We weren’t wrong. 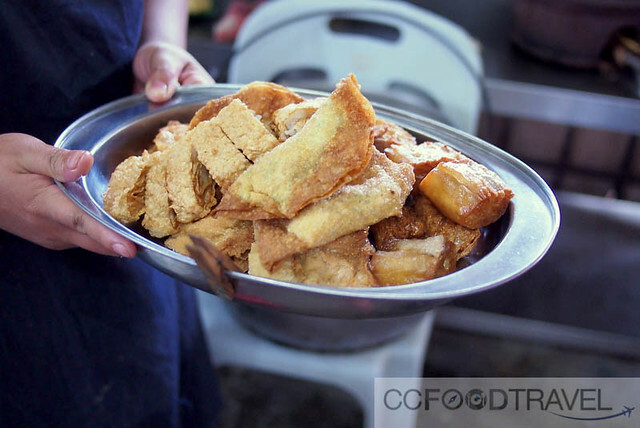 Again, large square sheets of deep fried foo chok, nicely and neatly stuffed with a mixture of pork and fish. Them YTF stuffers at this shop are definitely obsessive compulsive – neat and sweet, ready to eat! The Sui Kao looked like it might possess a nice crunchy side to it, so we ordered that too. 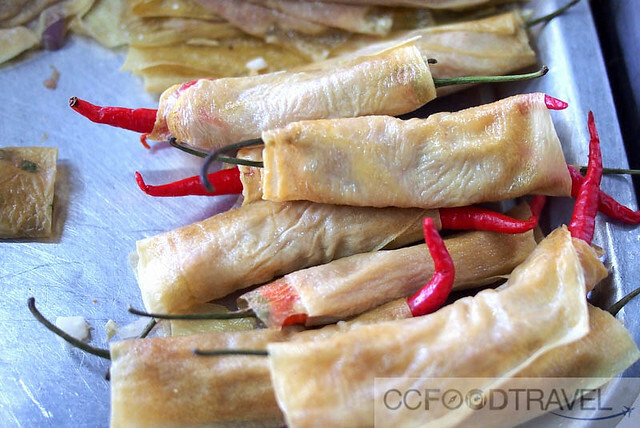 We loved the bits of turnip and coriander inside which were like explosive pockets of yum. Extremely fragrant with an addictive texture.. 100 marks for this. You should judge how good a place is by how many tables are empty. 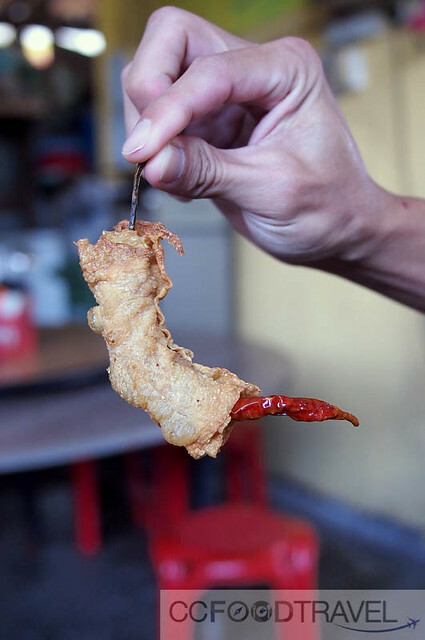 I pick up the chili Foo chok and wonder what’s in store for my tastebuds and tongue pain receptors. Priced at RM2.30 per piece it’s definitely a premium to pay for a good burn. Apparently this chili is expensive on the market, hence the price. 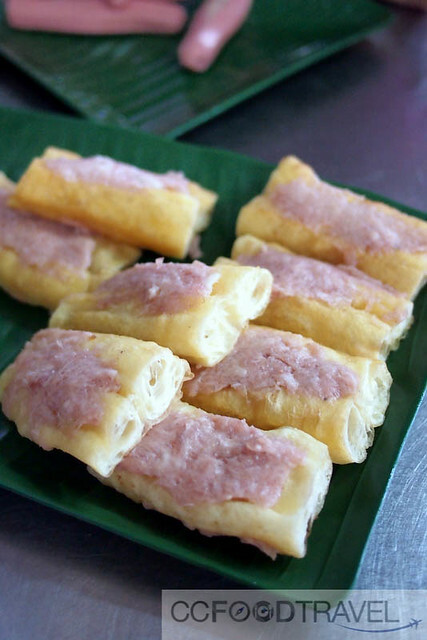 In fact, the other YTF offerings are not cheap either, priced at RM1.40 per piece it’s 40 cents more costly than the ones you can get in PJ – SS3 Hup Soon has a pretty good one actually and it is not as expensive – but more about that in another post. If you count to 5, slowly, you might just think to yourself, that this chili’s heat, is a ‘no-show’. Then all of a sudden the burn hits you. Oh, it’s spicy all right. Insidious and relentless, it takes no more than 3 minutes before Cumi’s face is covered in little beads of sweat. Constricted pupils, sweating, palpitations.. all them cholinergic receptors in overdrive. If you can eat an entire chili in one go (chew, not swallow) I’d say your tolerance for heat is pretty high. It comes with seeds and all – lots of fibre so you can count on evacuating firestones (not the song) the next day, for sure. If that heat is not enough, there’s also 3 kinds of sauces here. The nice lady passed us a bowl of freshly made chili sauce. It tasted a bit like Chicken rice chili sauce, but again, very spicy. 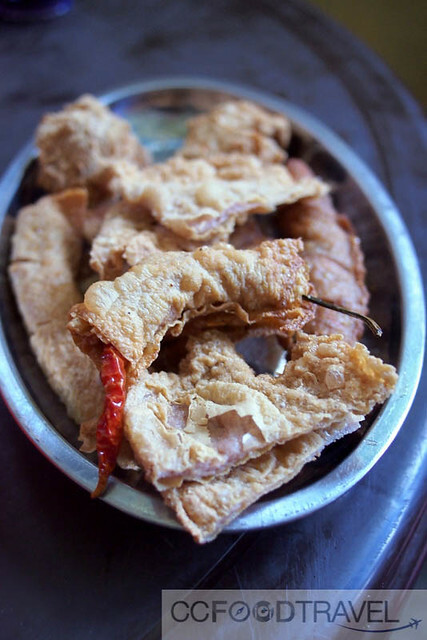 Lobak – tasty and greasy .. just the way lobak should be. 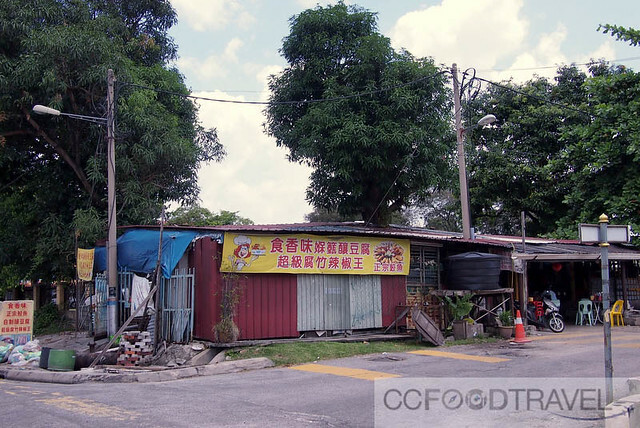 Definitely worth a visit to this shack in Jinjang, where the truly wild, world of extreme chilies reign supreme. And for all you pain freaks, don’t stop at one chili.. go for the entire lot.. There is pleasure in pain so might as well leave ecstatic. 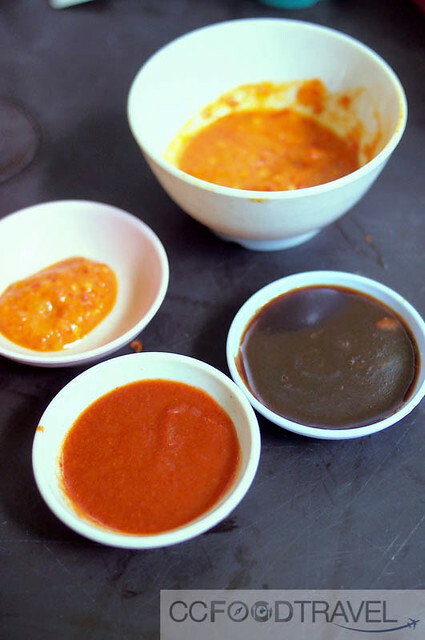 Just one look at the 3 sauces and I’m sold!!! I would want to help myself to lots of those. I like yongtofu in clear soup. All look so good here! OK the soup is really nothing to shout about (not herbal nor really porky sweet) BUT, the greens are great especially the jalapeño.. and of course the chili YTF! Same here.. But cannot be burnt or hard. I hate those! 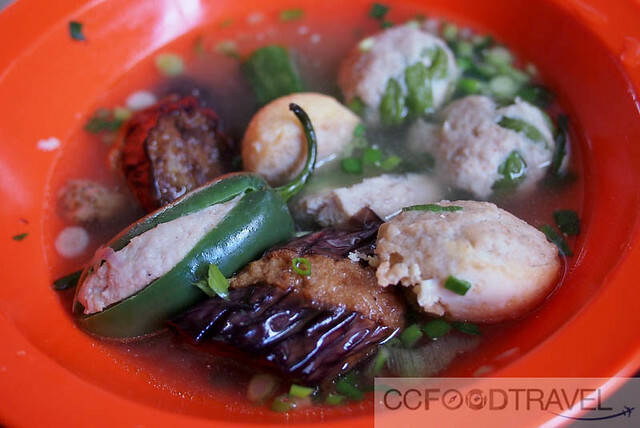 Stuffed chillies in fu chuk and jalapeno…I’ve not come across. Others…yes! The chillies look long and thin…a sign that they’re usually hot! Wouldn’t mind trying just to see how hot it is but I wouldn’t know where this shack is.